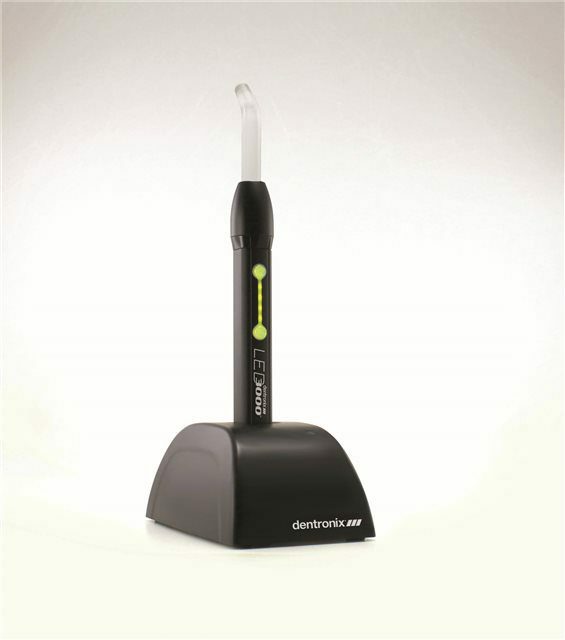 The Dentronix LED 3000 Kit includes light handle with rechargeable battery, 8 mm turbo tip, charger base, power cord, barrier sleeves, ortho light shield, tip light shields, battery replacement screwdriver, and user manual. It provides PAC-like performance in an affordable and reliable LED (Light Emitting Diode) design. Validated at 3250mW/cm2 in 3K mode, this light optimizes all of your light curing procedures. It is particularly effective for indirect bonding techniques. Where lower power is indicated, the LED 3000 has a Standard Mode with output of 1600 mW/cm2. Its light weight and perfect balance make the LED 3000 easy to handle. The handle is precision-machined from aircraft-grade aluminum for optimum durability. It’s extremely light weight and doesn’t get heavy when performing long bonding procedures. The optical glass turbo tip (8mm) is easily removable for sterilization. OM is programmed for 32 consecutive 3-second exposures, with a one second “OFF” interval accompanied by an audible signal. This allows for easy, uninterrupted mesio-distal navigation around the entire arch. Just press the shot button whenever your bonding sequence is done and the Ortho Mode resets. When compared to the 20-second curing times of standard lights, the LED 3000 can save almost 8 hours of chair time per every 100 patients. That’s amazing ROI for an orthodontist! Detailed instructions for care are provided in the user manual. The LED 3000 is delivered with disposable barrier sleeves to prevent cross-contamination. Surface disinfection of the handle can be accomplished with a quarternary/alcohol blend disinfectant. Do not use glutaraldehydes, denatured alcohol, Lysol®, phenols, ammonia complex, bleach, or iodine complex. This device should not be immersed in liquids. The fiber optic turbo tip (light guide) is removable and can be autoclaved. Ortho mode cures brackets in 3-seconds per side. Stores in tabletop charger so it’s always ready to go. Only ships via UPS Ground.